<!-Génér�Epar Avanquest Technology v:8.0. Pour plus d’information, visitez : http://www.avanquest.com --> Jazzy Jen South Jersey Face Painter and Balloon Twister – Highly Recommended! If you are not satisfied with our services or you don't feel we've delivered all we promised, YOU DON'T PAY. In fact, there is no money due until AFTER the performance and ONLY if you are 100% satisfied.
" Jen was the perfect combination of speed and artistry, completing beautiful designs while working efficiently. We truly appreciated Jen's professionalism, courtesy, talent, and stamina! I would definitely recommend Face Painting by Jen, and look forward to working with her in the future." --Tracy M. Wiser, Wiserlink, Inc.
" Jen our face painter was professional and was a real pleasure with the many children she worked with. I would hire them again and would highly recommend them for this service to others as well as I would hire them to try their other services. Thank you"
" I am so thrilled I found Face Painting by Jen. Her work was absolutely amazing! Her painting skills were incredible! If you need Ken Northridge's services, don't hesitate--book!!!!!!" Thank you so much for making my party wonderful!!!" " I just had to tell you how wonderful Jen was. She was on time, efficient, happy and you can tell she loves what she does. She far exceeded my expectations. She will certainly come highly recommended from us and we hope to use her again in the future. She made our daughters party even better!" " What a fantastic job and price. We were so pleased with Jens' work. She showed up just as she said she would,on time with a warm smile. Jens' art work was beautiful. All our guests loved it. She was so kind and paitient with all the children. She even did the adults,lol. One of the little girls at our party smeared her face all up...Jen had no problem giving her another. 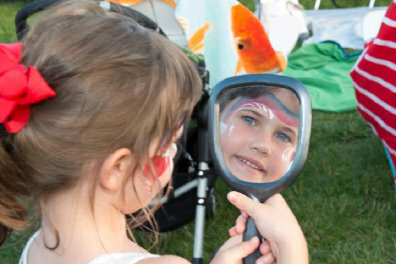 We have 3 children and will definetly be using them again (face painting and magic show). Thanks for making it an incredible day. We look forward to having you at our next party and probably some of our friends parties too. Thank you again ;) "
Okay, how much does this cost? Only the best quality, hypoallergenic, water-based and washable face paints are used! Click the document below to view our current Liability Insurance. We charge $150 for the first hour and $100 for each additional hour, anywhere in South Jersey. Jen can paint approximately 15 to 20 faces per hour and make about 20 balloons every 30-minutes. Jazzy Jen waves her magical paint brush for children of all ages as she creates your favorite things. From cute litte butterflies to full blown green-eyed monsters, her ability turns your event into a gallery of unique pieces of art. Jen has received hands-on trianing by some of the top professionals in the country, such as Pashur, Mark Reid, Mama Clown, Brian and Nicke Wolfe. Not only has Jen been trained by nationally accredited artist Donna Dewberry, she is also a Certified One Stroke Instructor. Jen combines her many years of teaching and tutoring to give your party goers a delightful experience!